Are you looking for a new staff member? Let us provide you with a pre-qualified, pre-screened employee to assist you in running your home. Daily, we are busy recruiting, interviewing, and screening to compile our industries most talented professionals to meet your needs. Our Process in 5 Easy Steps! There is no registration fee to start a search for your new employee. Our fees are only billed if we are successful in referring a candidate you hire. Your search is initiated when you read, agree to, and sign our Fee Agreement. Upon receipt of a signed fee agreement confirming your understanding of our financial terms, we will start sending candidates for your consideration. How do I give you a job description? We’ve made the process easy by offering you choices. You can complete our optional “registration forms” and send them to us, or you can speak to a consultant who will interview you over the phone and create a job description for you. Once you and your consultant have agreed on a job description, reviewed salary and benefits, discussed tax and labor laws and current market conditions it will be time to interview candidates. You may interview as many candidates as we have available. Our process begins with sending resumes/profiles of suitable candidates. If you identify one or more candidates of interest, Aunt Ann’s In-House staffing will arrange interviews for you at your convenience. Once you have identified the ideal candidate and an offer has been discussed and accepted by both parties, we suggest a working interview. This option allows you and the candidate to see if your household is a match. You‘ll have a better understanding of how the candidate will perform the job functions in your household. Our experience has shown that scheduling a working interview from 1 to 5 days assists all parties in confirming the hiring decision. Of course, you must pay the potential employee for their services during this time; however, as a courtesy, Aunt Ann’s In-House Staffing will not charge a referral fee for the working interview. Aunt Ann’s In-House Staffing understands the importance of finding trustworthy employees for your home. Once you have extended an offer and it is accepted, additional background investigations will be run at OUR agency cost. Other agencies charge an additional fee for these checks. 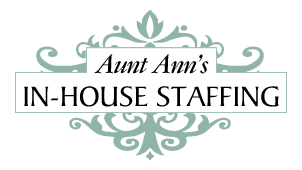 Aunt Ann’s In-House Staffing provides these checks at no additional cost. Ongoing support and availability for the duration of the employment.